Our first day on the job we had breakfast at 7:30am and left for the site at 8:30am. 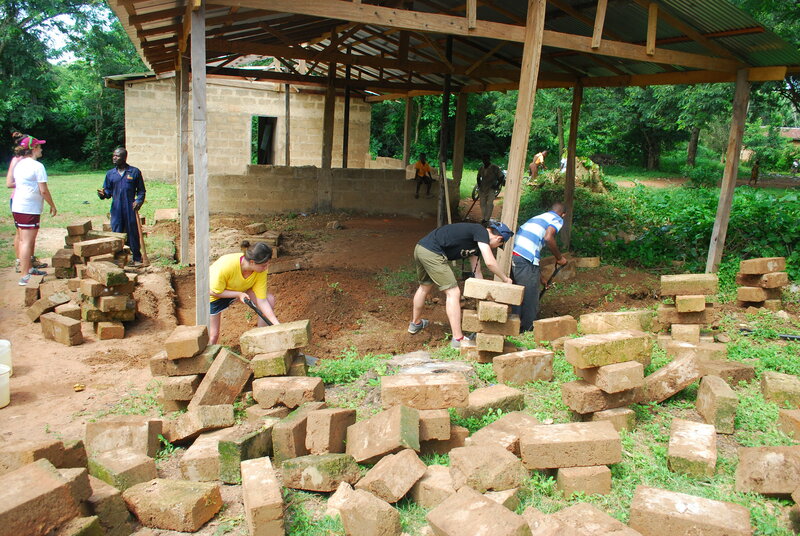 We played with the kids for a little before we started working and then everyone, including the children, helped us move huge bricks from one side of the field to the other. The children’s strength is unbelievable! 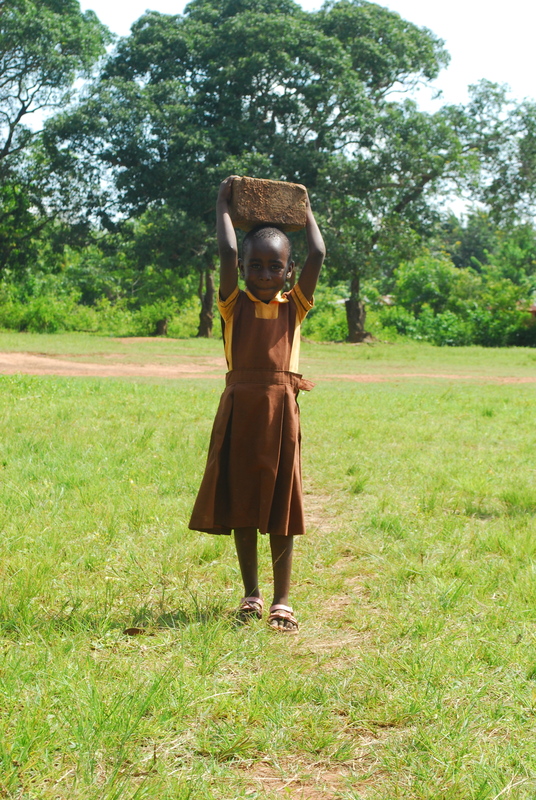 I certainly could not carry one brick by myself, and these kids could carry them on their heads!! I felt very ashamed and weak. Our next task was to mix the foundation for the classroom floor — sand, one bag of cement mix, water, and rocks. We carried big pans of the mixture to the masons to lay on the ground. We also mixed mortar — sand, one bad of cement mix, and water to fill the gaps between the bricks and keep them in place. We broke for a delicious lunch at 12:30, a Ghanian traditional cuisine — “Red Red.” Red Red consists of fried plantains and black eyed peas in a delicious red sauce. This became my favorite meal. When we returned back to work, all the children were gone. It was nice to have some peace and quiet while working. The rest of the day was pretty slow — bringing pans of mortar to the masons and making more mortar. There was a limited supply of tools, so only 2 of us could help the masons laying the bricks. The rest of the bricks were drying in the sun on the other side of the field. 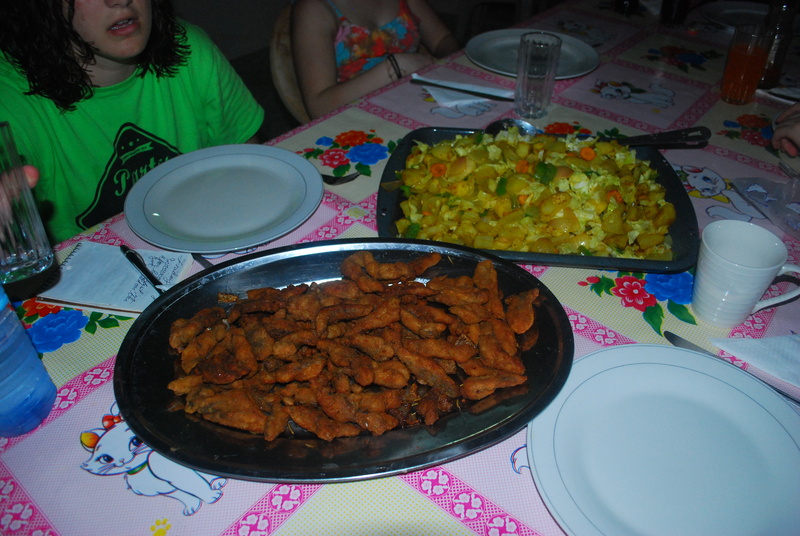 After our first day of work, we had a delicious meal of mixed veggies and potatoes with Ma Tess’ version of fried fish sticks. It was delicious, especially with the mango chutney we bought from the store. We then went to the local library, which was founded by Derrick’s family and read to the children.